November 24 1908 -- Tomorrow night featherweights Abe Attell and Freddie Welsh will meet for a 15-rounder at Jeffries Arena. Welsh will win on points. The next decade was one of the most important in syndicate history. New companies came into existence and there began an era of sharp competition which was destined to extend the use of syndicate service over fully two-thirds of the United States. I stayed and watched them for two days. No one came to relieve me so I had to run the cart into the lake in order to try to save the type and chases. When I returned two days later I found Mr. Kellogg, Mr. Schock and my brother standing over the body of a man who had been burned up on the lakefront, and they thought the remains were what were left of me. They were all so glad to see me alive and safe they forgot all about the cart and type. When I took them over to the place where I had run the cart into the water, we found some one had pulled out the cart and taken away the contents. A few type were still on the ground and a man and some boys were picking them up. This building was full of paper stock in packages and bundles which of course made a slow-burning, terribly fierce fire. Our entire plant was dumped into and buried in this red-hot furnace. Undaunted by the calamity, Kellogg sent Schock to Philadelphia and New York to purchase new presses, type and other material. 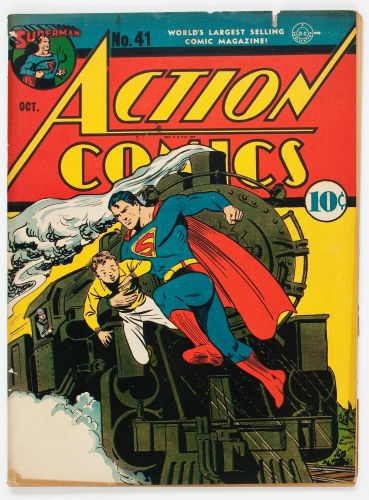 Every train out of Chicago was packed with refugees from the stricken city, most of whom believed that it would never be rebuilt. Schock made the long journey east "dividing the time sitting on the coal box and on the steps of the smoker." But he brought back the necessary machinery and found that Kellogg, after a long search, had finally found a new location for his business—an old macaroni factory at 63-65 South Canal Street. There he started the rehabilitation of his wrecked business. His difficulty was all the greater because his competitor, the Chicago Newspaper Union, had come through the conflagration unscathed. Originally located at 13 North Jefferson Street, a short time before the fire, its equipment had been moved to South Division Street. When the fire was over it was one of the few printing houses in Chicago that had escaped destruction. 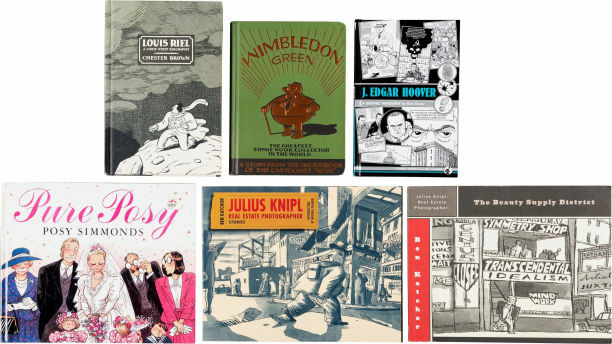 "Thither burned-out publishers flocked," says Andreas in his "History of Chicago." "Additional shafting and presses were put in. 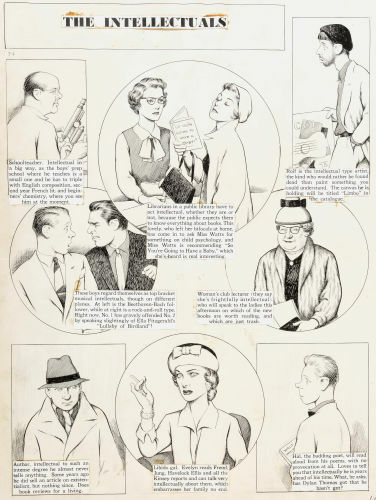 Mr. Strong gave up his own office to those in distress and with a pile of paper for an editorial and cashier's desk, he operated five presses and two gangs of men day and night, publishing the Republican, the Post, the Staats Zeitung, the Union and numerous others." 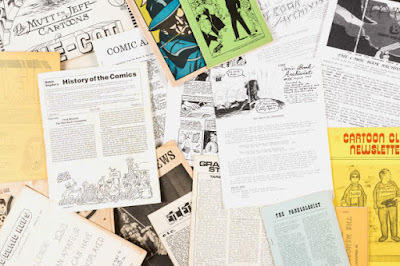 Moreover the Chicago Newspaper Union was able to continue supplying service to its country newspaper patrons. So while it was "business as usual" for the Cramer, Aikens and Cramer company, Kellogg had to start from scratch in carrying on his operations. The fire in Chicago had the curious effect of spoiling the "outsides" of nearly two hundred weekly newspapers which are published hundreds of miles from that city, in Illinois, Iowa, Wisconsin and Minnesota. 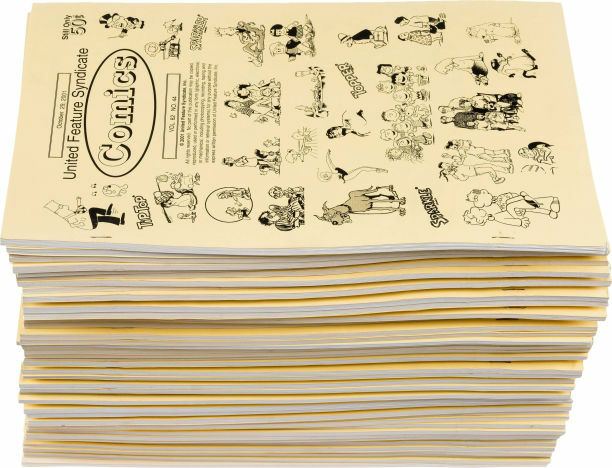 One of the leading printers of Chicago did a large business in printing these "outsides" in duplicate and sending them to different places, where the local publishers printed the news on the other side. The farmers who depended upon these sheets for their weekly news must have been puzzled to know how the Chicago fire could have deprived them of their village newspaper while the home office remained intact. 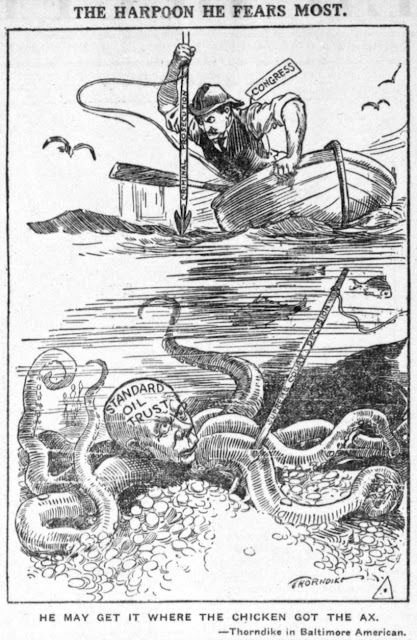 Some of the London papers are making merry over the discovery that a large number of local newspapers were formerly furnished with their "outsides" by certain enterprising printers in Chicago, and describe in humorous language the dismay that must have ensued throughout Illinois, Iowa, Wisconsin and Minnesota when the Great Fire deprived them of this resource. I happen to know that the same thing has been, and is, still done in this country, only here it is the "insides" and not the "outsides" which the London contractors furnish to the country press. 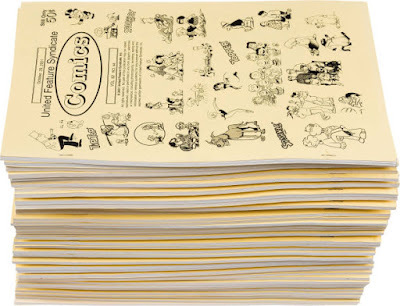 These "insides" are made up of the current general news of the day, cribbed editorials, tales, essays, poetry, etc., while the "outsides" are reserved for home advertisements, local news, etc. There is no harm in the system. On the contrary, the country people get a much better local newspaper than they could obtain in any other way. Although the two pioneer newspaper syndicates in Chicago rallied swiftly from the disaster, a new threat to the growing industry arose. A postal bill passed by the congress of 1872-73 contained in its original form the following provision: "Weekly newspapers within the respective counties where the same are actually and wholly printed and published, none other, may pass through the mails free of postage, as provided in the eighth clause of Section 184 of the 'Act to revise, consolidate, and amend the statutes relating to the Post Office Department.'" This bill was aimed directly at the new auxiliary newspaper service. 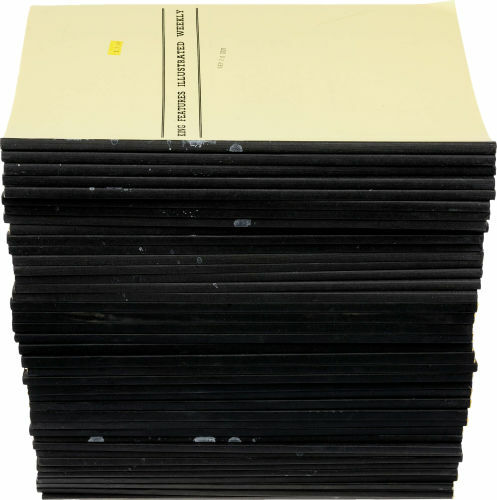 Representative Farnsworth of Illinois, chairman of the postal committee that framed the bill, stated that its object was to cut off weekly newspapers using readyprint from the benefits of free postage. 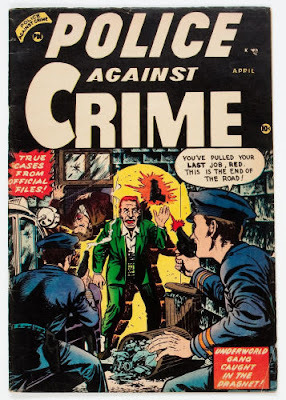 The joker in it was the phrase "actually and wholly printed and published, none other." The publishers of more than 1,300 country newspapers using the service were aroused by this bill. They flooded congress with their letters of protest. As a result Farnsworth, upon instructions from the committee, struck out the offending phrase and congress passed the bill with that provision thus amended. All ambiguity in the matter was removed by the postal law of 1874 which provided: "That newspapers, one copy to each actual subscriber residing within the county where the same are printed, in whole or in part, and published, shall go free through the mails." No sooner was this danger to the syndicate business averted than another threatened it. In 1867 Kellogg, in an effort to meet the competition of Cramer, Aikens and Cramer, had reduced the price of his printed sheets to 50 cents a quire. In 1869 he cut it down to 40 cents and the next year to 36 cents. 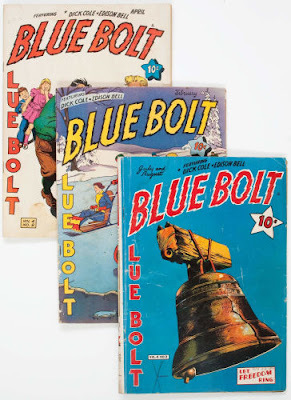 His price dropped to 20 cents in 1872 but the business stagnation which followed the panic year of 1873 halted any further radical downward trend because the scarcity of advertising made it impossible for any of the companies to cheapen the price of their product. 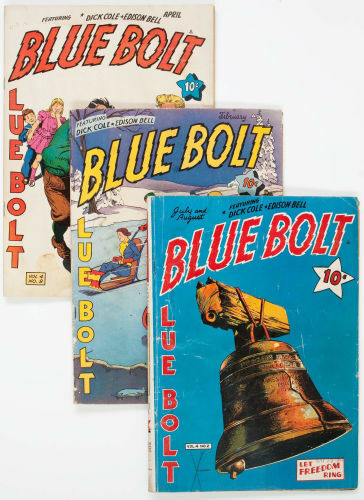 Another factor in making it difficult for them to secure advertising was the competition from magazines and periodicals whose circulations were increasing rapidly in this period. Advertisers compared the per thousand rates of these publications with the per thousand rate of the syndicate service and insisted upon an adjustment which would make them more nearly equal. In the early days of the business, production costs were comparatively low but when the syndicates began improving their services, costs mounted. At first Kellogg and Schock, equipped with scissors and paste-pot, were able to take care of the editorial needs of their syndicate. 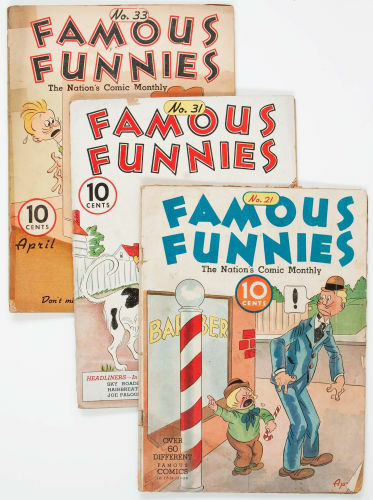 But as the business and mechanical details began to require more and more attention, Kellogg saw that it was necessary to have a regular editorial staff to supply the constantly growing demands of publishers for a greater quantity and variety of literary, news and political matter. 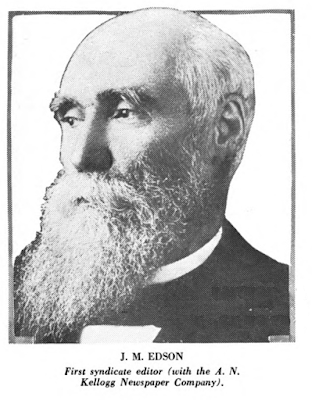 Accordingly he engaged J. M. Edson, a former middle western country publisher, who in 1867 became the first syndicate editor in the history of American journalism. Four years later I. F. Guiwits, who had started in the syndicate business with his Franklin Printing Company at Middletown, N.Y., in 1869, was added to the editorial staff and from that time on its personnel was increased steadily. In 1871 Kellogg offered the first continued story in his printed sheets and the next year, the first illustrated articles. In 1873 the Chicago Newspaper Union took the first step toward making the "insides" more than a mere collection of "time copy" by offering state news to their subscribers. Thereafter, improvements and changes in making up the pages for different clients were numerous. All of these alterations occurring in the same forms almost doubled the cost of production. But it was these innovations which made the syndicate service popular and aided in its rapid growth. 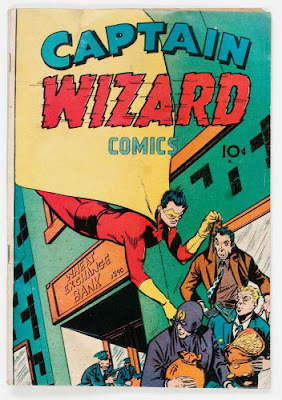 Despite-the tribulations of fire, panic and sharp competition which Kellogg had encountered, he continued to expand his business. In May, 1872, he bought the syndicate business of Sheffield and Stone, St. Louis advertising agents, who had been supplying 116 papers, and soon thereafter he also acquired the business of Kimball and Taylor at Belleville, Ill. Placing Fernando C. Wood in charge, he began supplying the newspapers on both lists from the branch office which he established in St. Louis. 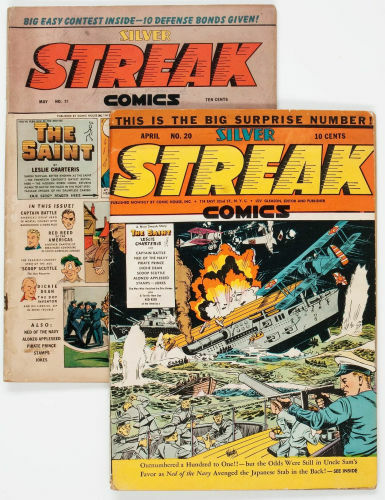 In connection with the St. Louis acquisition Kellogg did another bit of pioneering in the newspaper business worthy of mention. In the sixties there was no uniform measure for column widths in the country press. 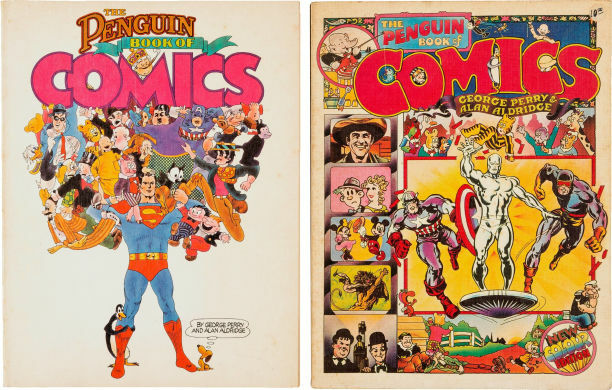 Every publisher was a "rugged individualist" who took pride in making his paper as different as possible from that of his neighbor. Sheffield and Stone had been issuing their printed sheets in two measures—12 1/2 ems and 13 1/2 ems—so that two sizes of paper had to be used in supplying their customers. As an economy measure Kellogg and Wood decided to use only one measure, 13 ems, and a standard size for the print paper. 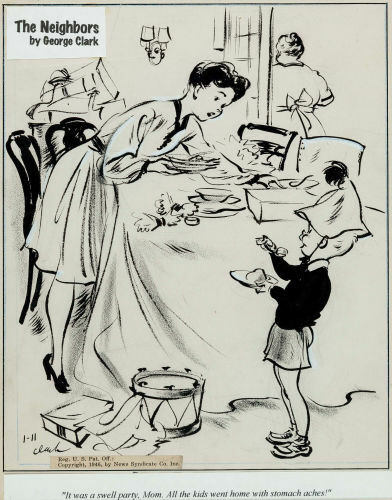 By offering to assist their patrons in making the change by exchanging leads and rules cut to the new measure, the Kellogg company converted the newspapers on their St.Louis list to the uniform measure. Later it was extended to general use in the country field, where it has been the standard until recent years when the 12-em column width began to supplant it. During this year an epidemic of yellow fever swept the South and forced the suspension of many businesses, among them a small syndicate in Memphis, Tenn. When it did not resume business, Kellogg saw his opportunity to invade the southern field and he did so by establishing a branch office in Memphis in 1884 with a list of 15 papers. "Spare no pains nor expense to get the best and freshest of news and literary matter." "It is as much the mark of a good editor to know what not to print as to be able to select good and appropriate matter." "When in doubt about the propriety of printing an article, leave it out; there is plenty of that which is unquestionably good and desirable." "In the news columns avoid, as far as possible, the giving of details of scandals and crimes—confining the accounts to mere statements of facts of general interest or importance." "There is always room for improvement and betterment. 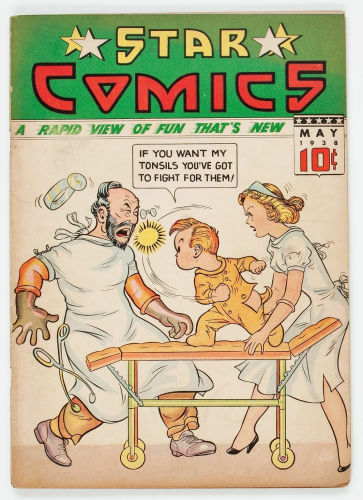 The best is none too good for the Kellogg service." 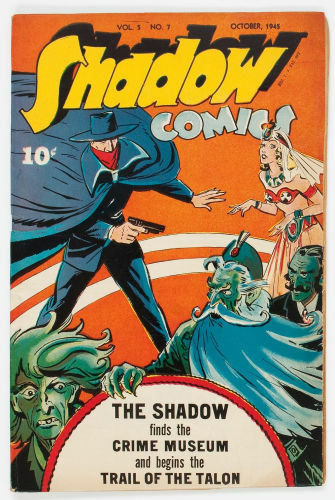 That man was Ansel Nash Kellogg, "The Father of the Newspaper Syndicate." 1. Strong had entered the office of the Evening' Wisconsin in 1860 as a compositor and two years later he was made foreman. The first printed sheets issued by Cramer, Aikens and Cramer in 1864 were made up under his direction. 2. Bradner, Smith and Company is still in business in Chicago, only a short distance away from the offices of the successors to Kellogg's company—Western Newspaper Union. 3. This company had been established originally in 1874 by Elijah Brown, the famous "Ram's Horn Paragrapher." 4. The A. N. Kellogg Newspaper company was Incorporated in Illinois on March 5, 1881, with a capital stock of $200,000. The stockholders were Kellogg, Edwin E. Pratt, William H. Thomson, J. M. Edson, James J. Schock, F. C. Wood, H. B. Speed and W. W. Hallock. Schock, who set the first type for Kellogg's syndicate service, was mechanical superintendent for many years and later became treasurer of the company. His son, Frank Schock, is now (1935) foreman of the composing room for Western Newspaper Union. 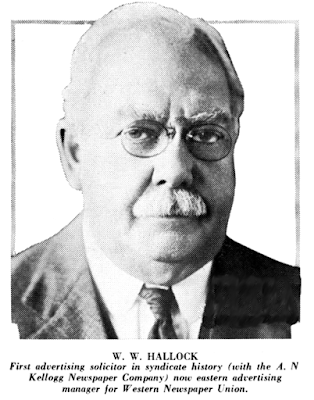 Hallock, who entered Kellogg's employ soon after the Chicago fire, became an advertising expert and in 1878 established the eastern advertising office for Kellogg, is at present eastern advertising manager for Western Newspaper Union. 5. M. M. Quaife—"How A. N. Kellogg Revolutionized America's Country Press," in the National Printer-Journalist, February, 1922. Willis Hale Thorndike was born in Stockton, California, on February 8, 1872, according to Who’s Who in America (1910.). 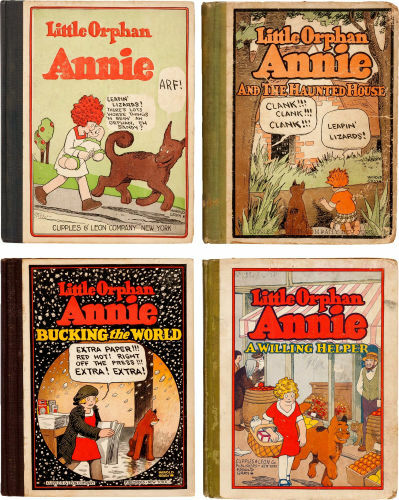 His parents were Albert Thorndike and Mary Page. In the 1880 U.S. Federal Census, Thorndike was the third of four children. The family resided in Stockton. Who’s Who said Thorndike was educated in public schools. The 1888 Stockton city directory listed Thorndike, an artist, at 127 South Grant. Who Was Who in America with World Notables, Volume V, 1969–1973, said Thorndike was an artist on the San Francisco Chronicle, from 1890 to 1892; the New York Herald, from 1896 to 1897. Who’s Who said Thorndike studied at the San Francisco Art School, the Art Students’ League in New York, and the Academy Julien in Paris. Thorndike was in Europe for two-and-a-half years. He was awarded first prize for a drawing from life, in Paris, 1894. 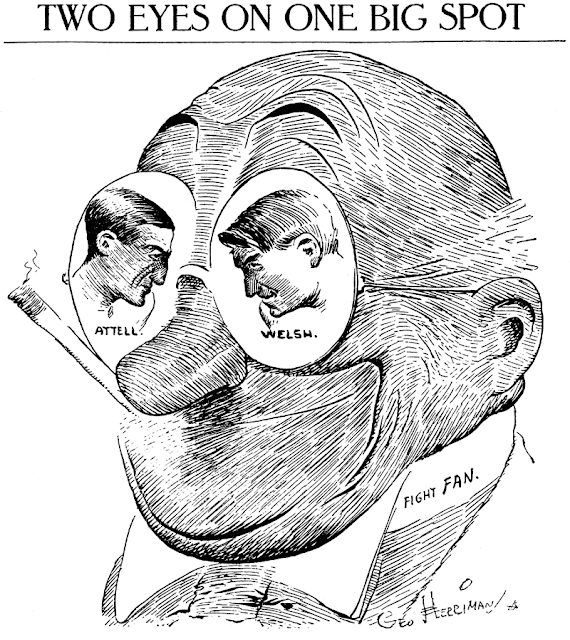 The San Francisco Call (California), December 1, 1895, said, “Willis H. Thorndike is also studying to illustrate. He makes very chic girls. He has been at Etaples this summer, on the coast of Belgium, and while there he has made a vast improvement in his painting.” A passenger list recorded his return on April 25, 1896, in New York City. The 1899 Stockton city directory listing had Thorndike at his old address, 127 South Grant. The following year, the 1900 census recorded Thorndike in San Francisco, California at 816 Sutter Street. At some point Thorndike moved to Montana. The Butte Inter Mountain (Montana), December 26, 1901, noted some of the guests at the Montana Hotel including Willis Thorndike and Miss Hunsicker. It is scarcely more than ten days ago that Willis forsook his bachelor friends and went before hymen’s altar. Before leaving on their wedding trip, Mr. and Mrs. Thorndike rented a house on upper Hickory street and left orders to have the place cleaned and made ready for their occupancy upon their return. Everything about the house was put in order, but the water pipes were overlooked and the other night they froze up tight. The orders left for the coal man to put in a supply of fuel were not obeyed, consequently when the young couple reached home the situation was not very pleasing to them. Some friends, who met them at the depot, gave them assistance in making a fire in the parlor. But the worst came the next morning when the water pipes in the rear part of the house bursted, completely flooding the kitchen. 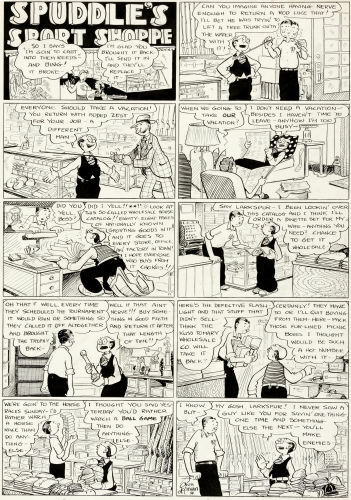 Between the plumbers, who have had the house in charge for a couple of days and freezing to death, Willis has concluded that the responsibilities of a married man are indeed burdensome, and he believes he is having more than his share of trouble. While Thorndike was in New York City, he produced some strips for two newspapers. American Newspaper Comics (2012) said the New York World published The Hoodoo Jockery and His Sure-Thing Mount, from April 25 to June 1, 1904; and Just to See What It Would Do, from November 25 to December 28, 1904. The next year, the New York Evening Telegram carried Hawkshaw the Wise Detective of Herald Square, from January 24 to June 26, 1905; and Samson, the Strong Man, from February 10 to June 23, 1905. Who’s Who said Thorndike joined the staff of the Baltimore American in 1906. 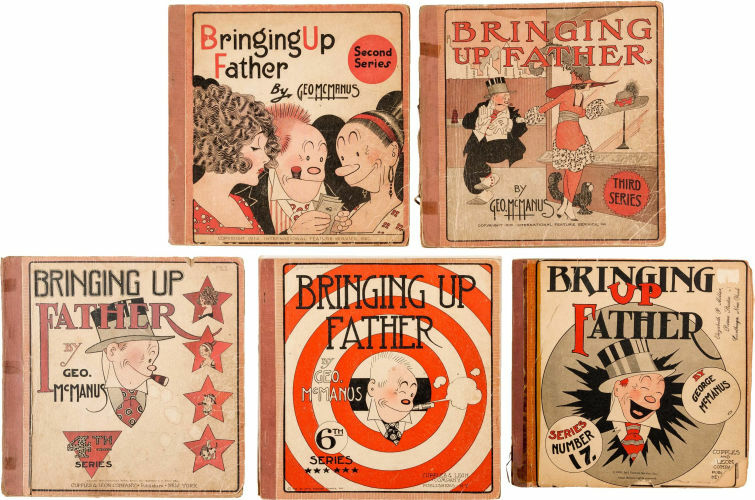 Thorndike’s editorial cartoons were reprinted in publications such as the Literary Digest, here, here and here; the Steamboat Pilot; and Red Bluff News here and here. In Baltimore, Thorndike illustrated the 1908 book, A Woman of War and Other Stories. The 1910 census had Thorndike as a Baltimore resident at 1926 West Royal Terrace. 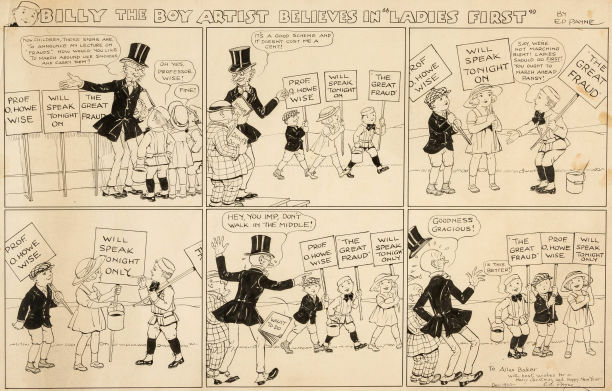 The Baltimore American, February 5, 1911, mentioned the cartoon exhibition of Thorndike and Robert Brook at the Charcoal Club. The first of a series of exhibition of cartoons by artists was opened in the rooms of the Charcoal Club last night. 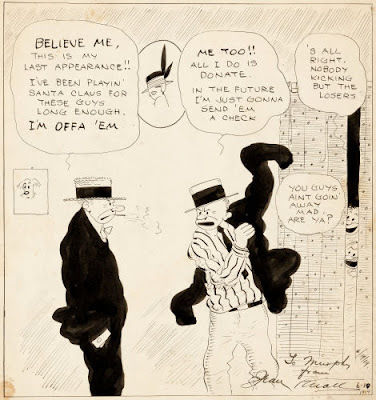 The opening exhibition is devoted to the works of Mr. Willis H. Thorndike, whose cartoons have appeared daily in The American for some years, and those of Mr. R. Brook, of the Star. 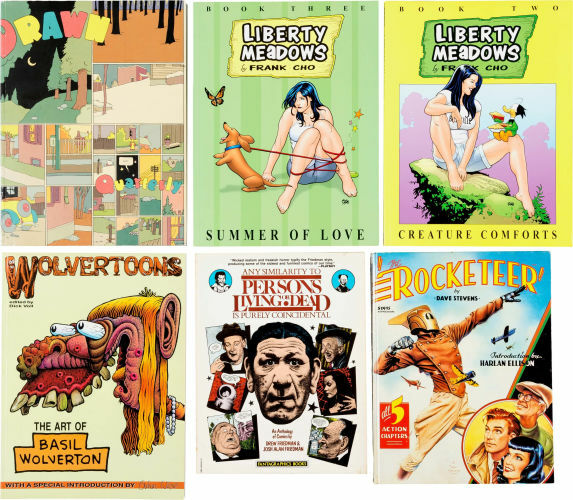 The exhibitions will continue all this week…. Butte History said Thorndike returned to California in 1915. A listing in the 1918 Los Angeles, California city directory, said artist Thorndike worked at 406 South Main in room 901, and lived at 4507 Prospect Avenue. Thorndike’s residence was 1811 North Alexandria, Los Angeles, in the 1920 census. His occupation was manager of an advertising company, located at 824 San Fernando Building in the 1920 city directory. Thorndike’s home address did not change in the 1930 census and 1933 city directory. Thorndike passed away March 18, 1940, in Los Angeles, according to the California Death Index and Find a Grave. 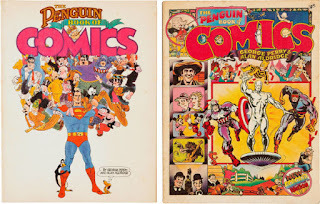 Two days later the San Francisco Chronicle reported his death. 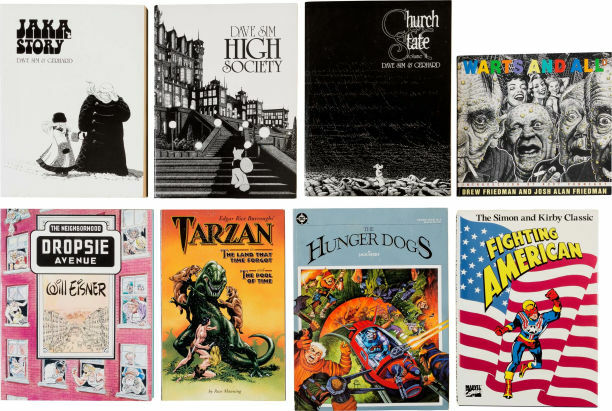 Los Angeles, March 19 (AP)— Funeral services will be held Thursday for Willis H. Thorndike, 68, once nationally known political cartoonist, who died Monday at his Hollywood home. 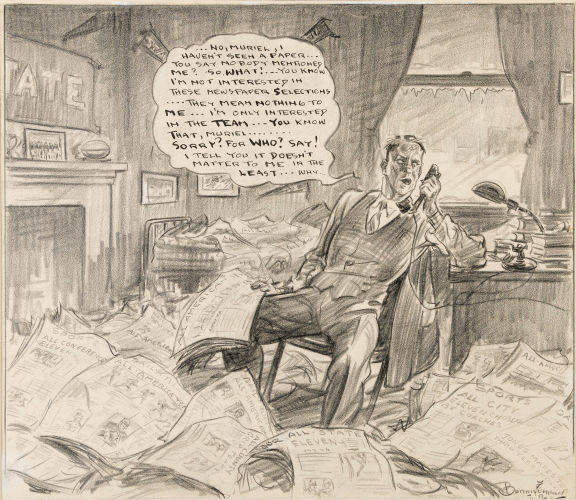 Thorndike started his career on The San Francisco Chronicle in 1890, studied drawing in Paris and later worked on the New York Herald, the Baltimore Sun and Anaconda Standard, during the mining boom at Anaconda, Mont. He retired about 15 years ago and has been living in Los Angeles since then. Surviving is his widow, Irma. Irma passed away August 28, 1968. I'm ashamed to admit that I succumbed to an annoying habit of the historian -- that of assigning vast importance to a bit of minutia. 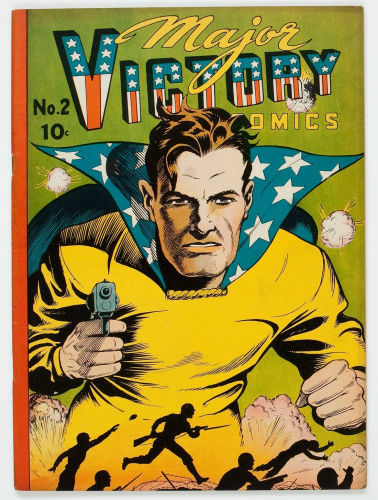 Like the archaeologist who claimed to have uncovered an entire lost civilization based on a pottery shard, and the paleontologist who declared the discovery of a new breed of dinosaur based on a single toe bone, I descibed Samson the Strong Man in my book as "an early superhero prototype." Obviously that is not true. 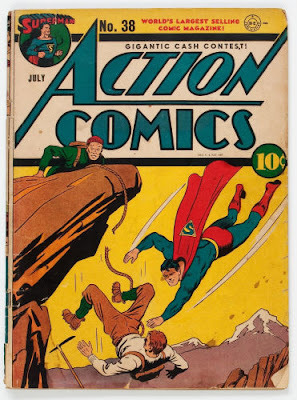 As you can see above, yes, Samson is really, really strong, impossibly so in fact. But does he really have super powers? Nah, course not. Our cartoonist is just using poetic license to make the point that this guy is strong. Nor is Samson a hero by any stretch of the imagination. 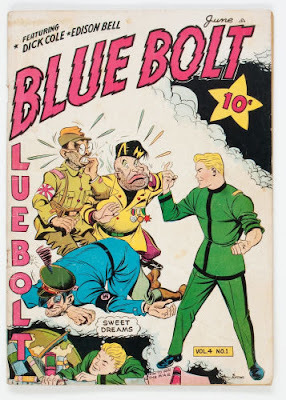 In fact, he's kind of a doofus, which is sort of the gag. Therefore, I apologize for trying to make something important out of Samson the Strong Man. It is, in fact, pretty darn unimportant by most measures. The strip appeared in the New York Evening Telegram once a week, on Fridays, from February 10 to June 23 1905. 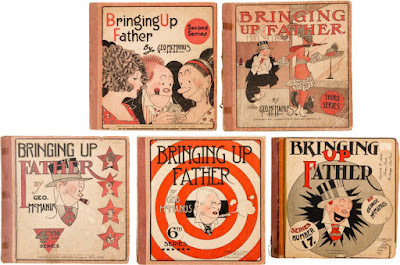 You needn't doubt that Telegram readers would much rather have seen the great Winsor McCay, the definite star cartoonist of the Telegram at the time, one extra day per week instead. 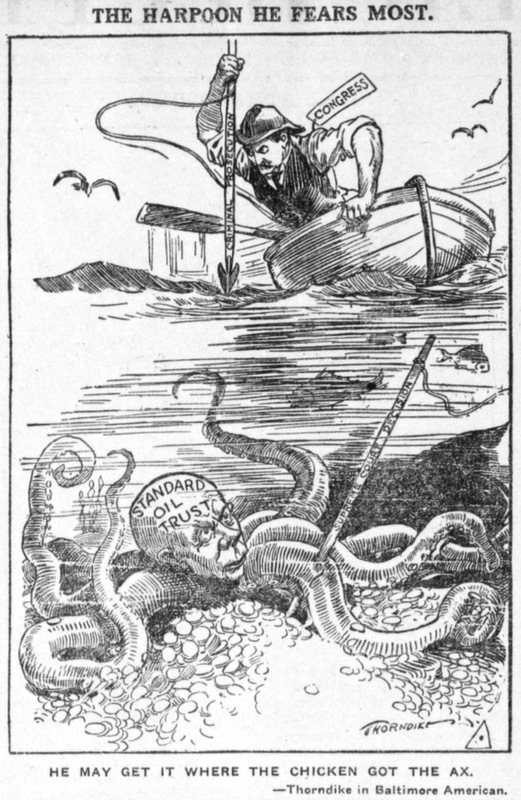 The cartoonist, who signed himself just 'Thorndike', had a couple short series in the Evening World in 1904, and then contributed this and one more series to the Telegram in 1905. 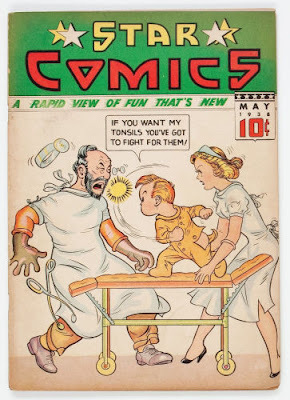 He was a pretty good cartoonist, but never really caught on to the mechanics of writing a comic strip. I'm sure no one missed him much when his strips ceased to appear. 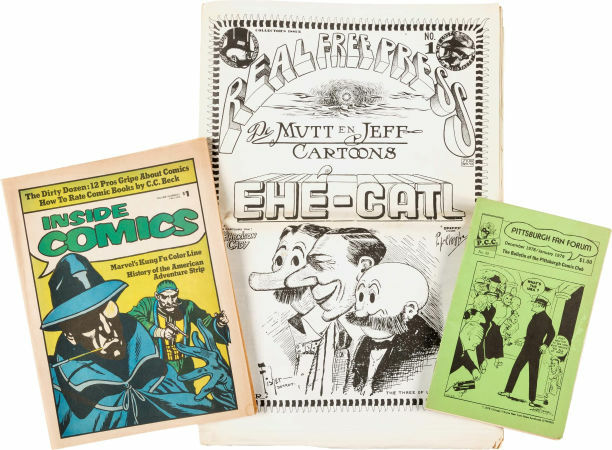 He did, however, continue in cartooning, and we'll learn more about that tomorrow, as Alex Jay has managed to sleuth out Thorndike's identity for an Ink-Slinger Profile. 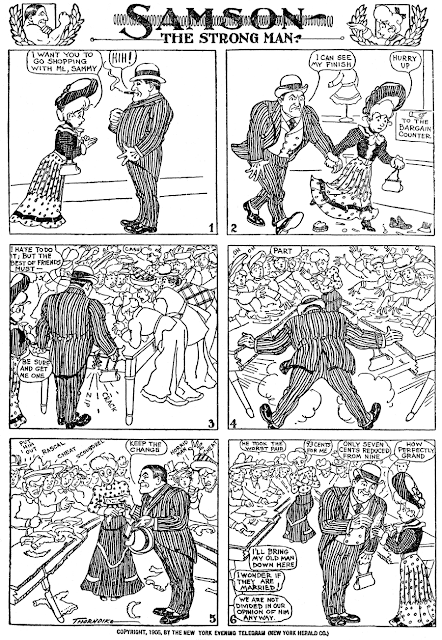 the Barnacle Press archive has strips from August 1905, so apparently it lasted beyond June. 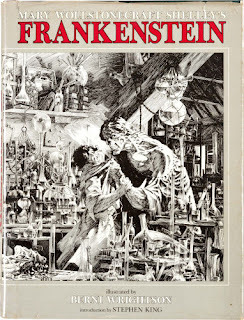 Francis Wellington Dahl was born in Wollaston, Massachusetts, on October 21, 1907, according to Who Was Who in America with World Notables, Volume V, 1969–1973. The Massachusetts birth record, at Ancestry.com, said he was the son of Joseph F. Dahl and Annie L. M. Boyd. The 1910 U.S. Federal Census recorded Dahl and his parents in Quincy, Massachusetts at 16 Green Street. His father was a transportation clerk. Quincy continued to be Dahl’s hometown in the 1920 census. His address was 25 Merrymount Avenue. The Dahl family lived next door at number 27 in the 1930 census which said Dahl was a newspaper cartoonist. 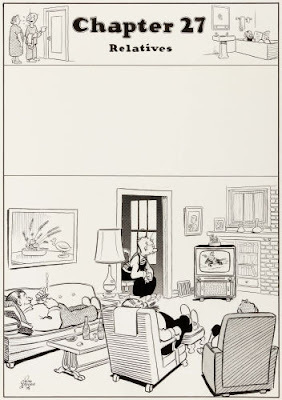 American Newspaper Comics (2012) said Dahl produced cartoons for the Boston Herald from June 17, 1929 to June 17, 1972. Who Was Who said Dahl then worked for the Boston Globe into 1973. In 1940, Dahl was married and had a daughter. He resided in Cambridge, Massachusetts at 182 Bowdoin. 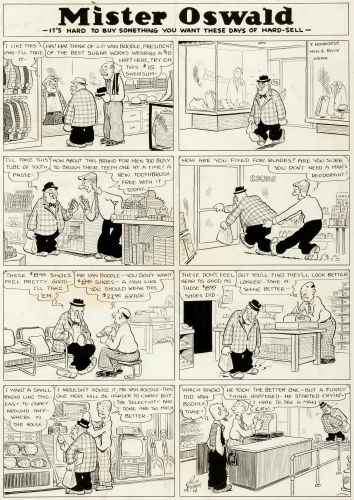 In 1935 Dahl was a Boston resident. Who Was Who said Dahl married Louise C. Bartlett on June 4, 1933. They had three children: Jane, Francis W., Jr. and Linda. 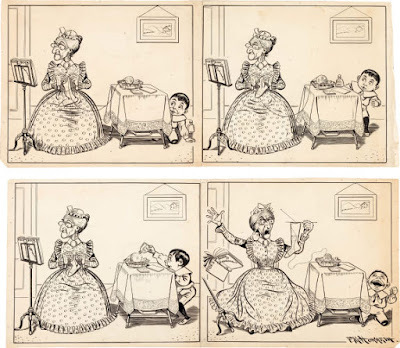 When Dahl broke his right arm in mid-December 1940, he taught himself to draw with his left hand. 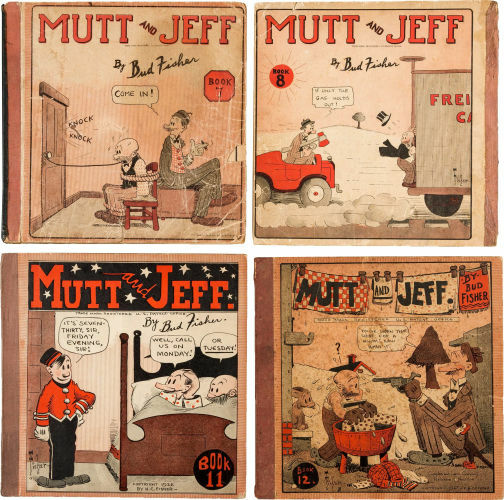 These cartoons were collected in a book. 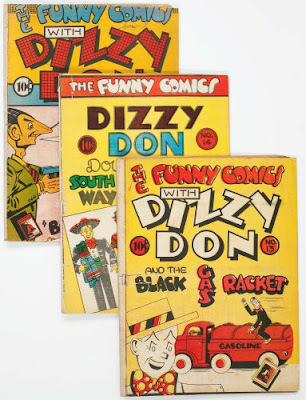 Half a dozen books featured Dahl’s work: Left Handed Compliments, 1941; Dahl’s Cartoons, 1943; What More Dahl? 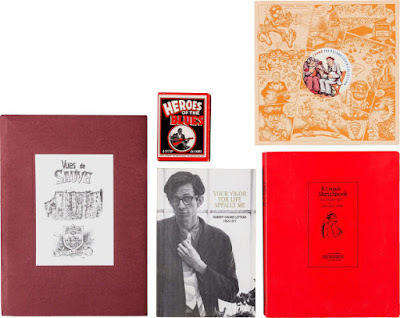 1944; Dahl’s Boston, 1946; Dahl’s Brave New World, 1947; and Birds, Beasts and Bostonians, 1954. Dahl passed away May 6, 1973, in Newton, Massachusetts. His death was reported the following day in the Herald American. Oh, yeah, I've seen some of his books-His depictions of the Boston Common squirells could scare the toughest New York rat! 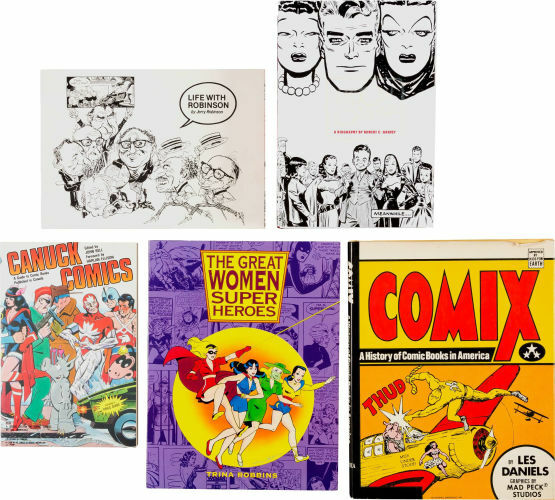 Another bunch of interesting lots up for sale this week, whether your interest is in original art, platinum books, comic books, or reference material. Auction ending this Sunday, June 5.Follow this link to my auction items. Super W.E. Hill page, this one about intellectuals. The line work is truly amazing. A very rare Billy the Boy Artist original, Ed Payne's 56-year running comic strip from the Boston Globe. 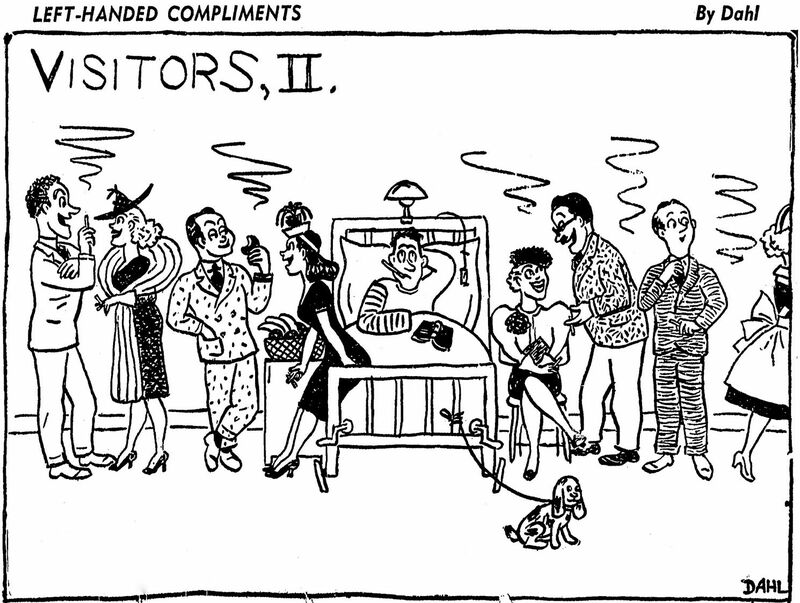 Ving Fuller Doc Syke originals aren't too hard to come by, but this one features a particularly wonderful gag. From the first year of the strip. Great baseball content in this Walter Gallaway drawing from an 1890s issue of Puck. I don't have the caption, but the kids' faces and body language tell you exactly what the gag is! Nicely framed. I'm flabbergasted that they put my two F.M. 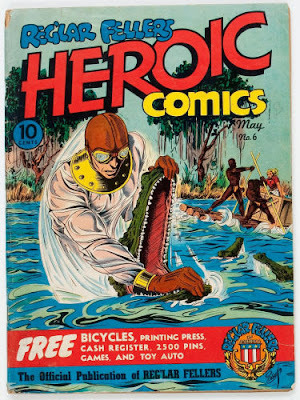 Howarth Puck back-cover gag strips into one lot, but here ya go. 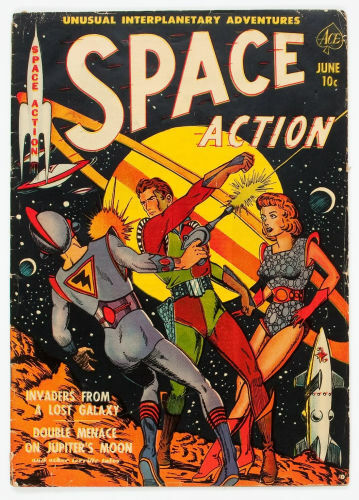 Incredible early Howarth. 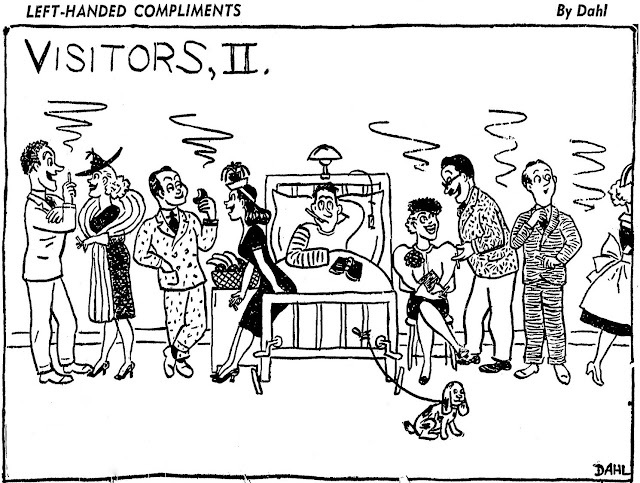 Great Jack Kent wordplay gag in this 1962 King Aroo daily. 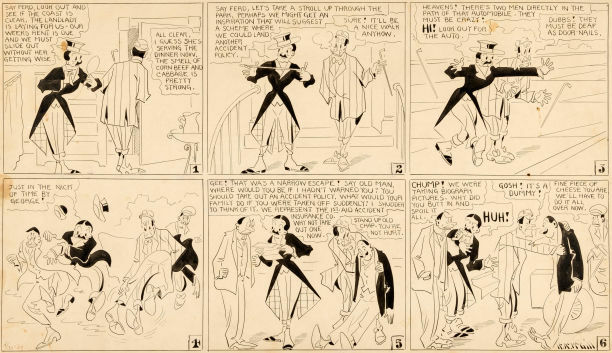 The grease-pencil work on this large 1930s Burris Jenkins piece is just superb. Nicely framed, too. 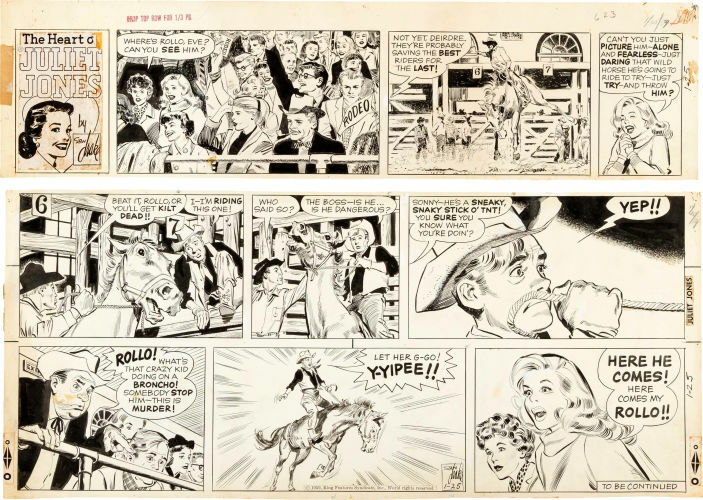 The irrepressible Joe & Asbestos and their horse-racing tips (to be added on printing day) were loved by the readers of the New York Mirror for decades. Stan Drake Sunday Heart of Juliet Jones at the rodeo. Yipee! Disney's Ralph Kent gave this special drawing of Mickey as the sorceror's apprentice to Jim Ivey at a late 1970s OrlandoCon. Walt Scott's The Little People, a mostly forgotten gem of comic art. 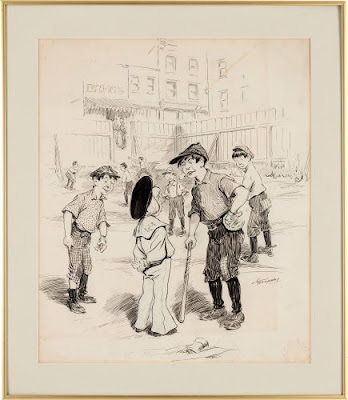 The Hall-Room Boys, Percy and Ferdie up to their standard goofball social-climbing in this nice 1909 example by Harold MacGill.Find another! I have no idea why I had this. 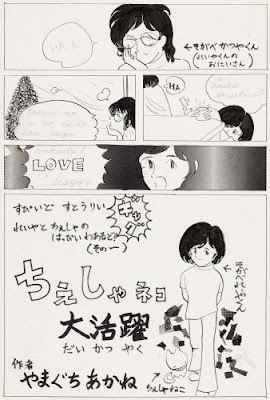 A complete Japanese manga story, probably from the mid-1980s I guess. Can anyone translate? 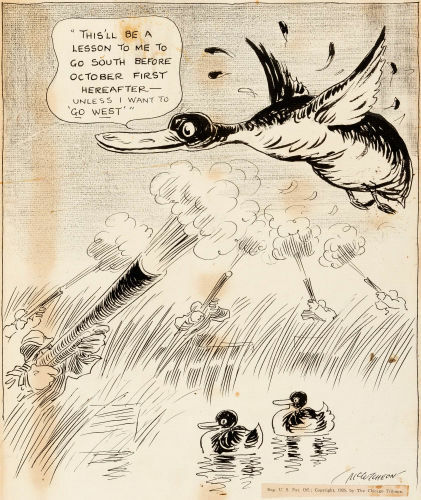 John T. McCutcheon, the grand old master of the Chicago Tribune editorial cartoonists, ushers in duck hunting season. One of my favorite Mr. Oswald gags -- the curse of being a leading citizen. 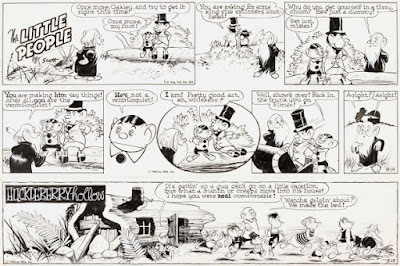 A Mr. Oswald chapter heading from the book that made him famous to cartooning lovers. 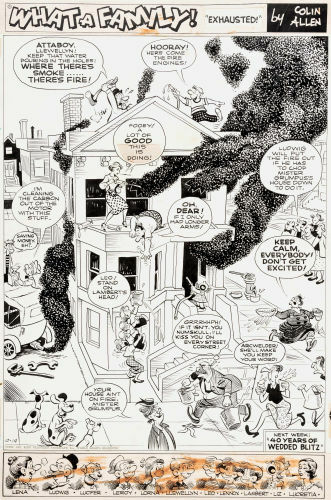 The great George Clark shows off his sumptuous brushwork in this The Neighbors panel. The classic poker-playing strip, Penny ante (aka Eddie's Friends), a Hearst mainstay. 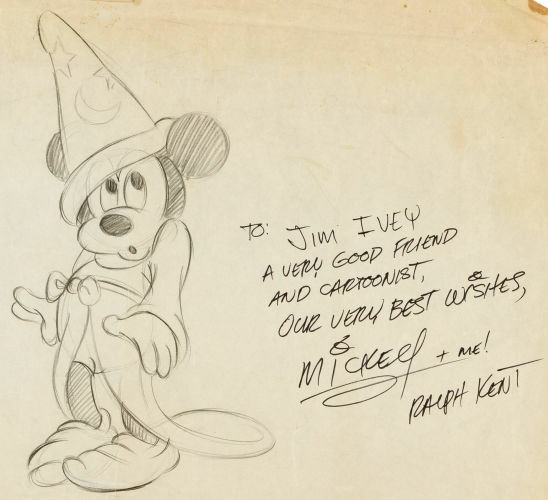 This example signed over to fellow Hearst cartoonist Jimmy Murphy by Jean Knott. After J. Carver Pusey's Benny left general syndication, it became an editorial cartoon feature of the Philadelphia Inquirer. 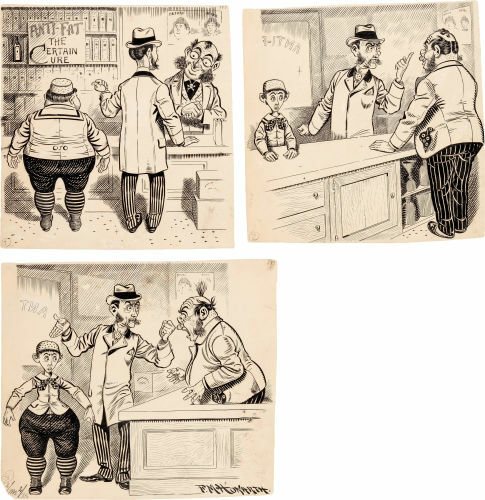 In 1942 the state liquor store employees went on strike, prompting this cartoon. 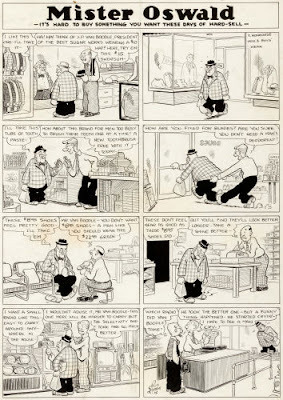 One of my favorite strips, Rudy by William Overgard. 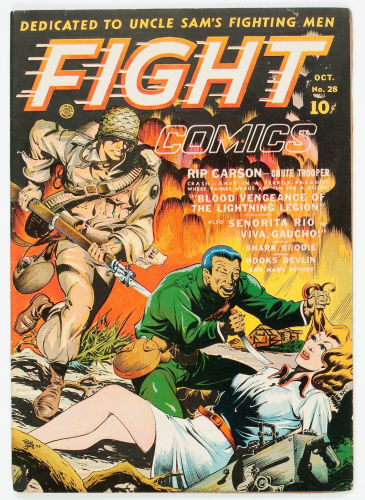 This example features an appearance by Greta Garbo! Spuddle's Sport Shoppe, superb example with lots and lots of Russ Johnson's signature details in the backgrounds. 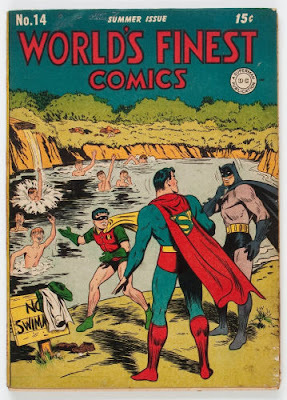 Colin Allen's little known full tab single-panel Sunday page is even more impressive in this large original. 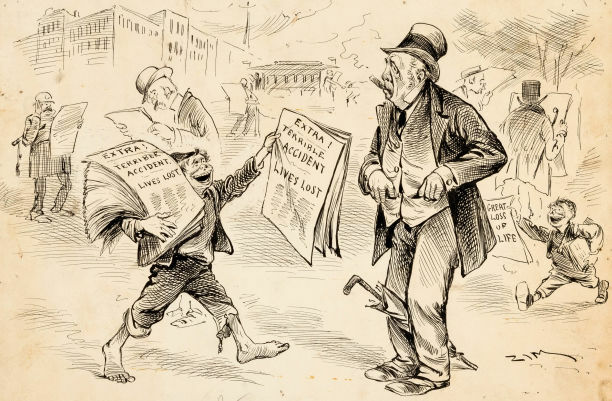 The great Zim comments on yellow journalism in the 1890s, with happy newsboys gleefully offering up the latest horrific disaster. 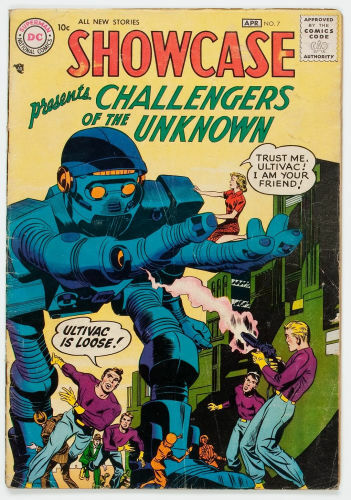 A very scarce comic book, and the contents are utterly bizarre. An esoteric gem. A big batch of TEN Famous Funnies issues, all in a single lot. Great reading! Three very rare Canadian comic books, all in a single lot. 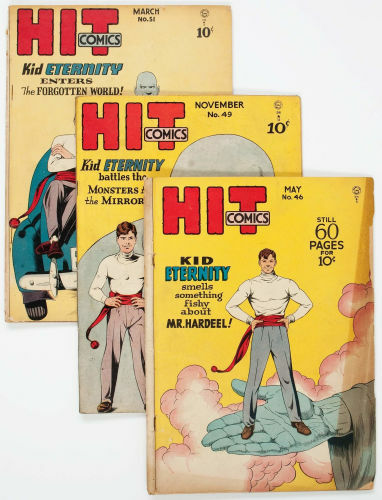 Five issue lot of Hit Comics, featuring one of my favorite characters, Kid Eternity. 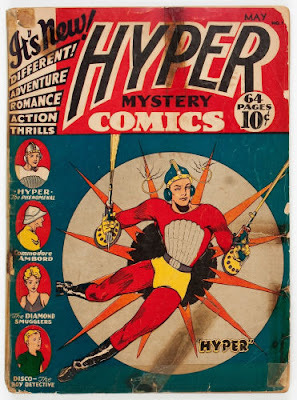 Low grade, but who could resist a comic book titled Hyper Mystery!! A set of five lower grade Little Orphan Annie Cupples & Leon books. And four higher grade ones -- Bucking The World is particularly nice. 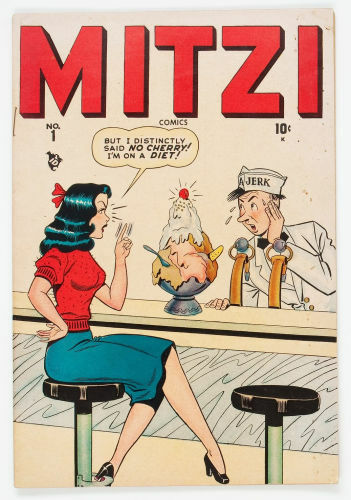 Kurtzman's Hey Look is the big attraction here, once you've stopped ogling Mitzi. 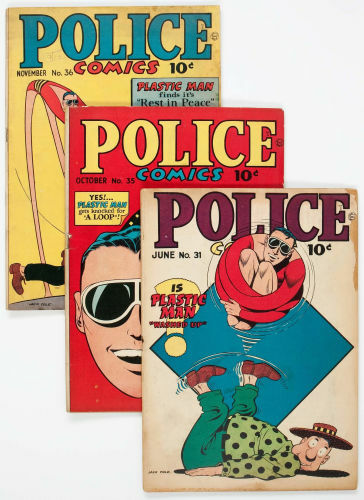 Eleven issues of Police Comics in one lot, featuring the wonderful Plastic Man by Jack Cole. 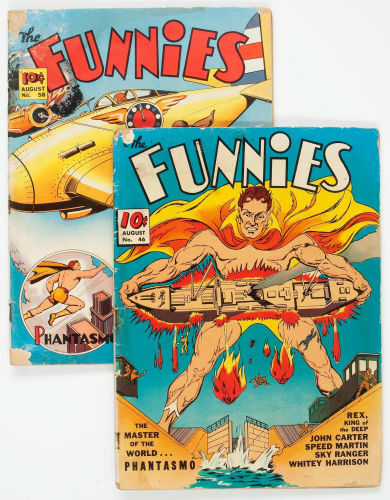 I've been surprised at the low bids on these -- is Jack Cole no longer a favorite? 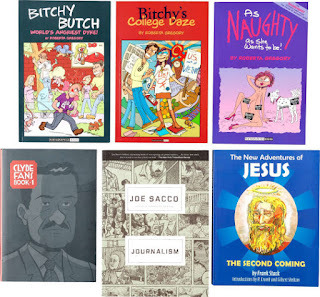 Three photos above, a group of 15 books; a little bit of everything in this rather random lot. 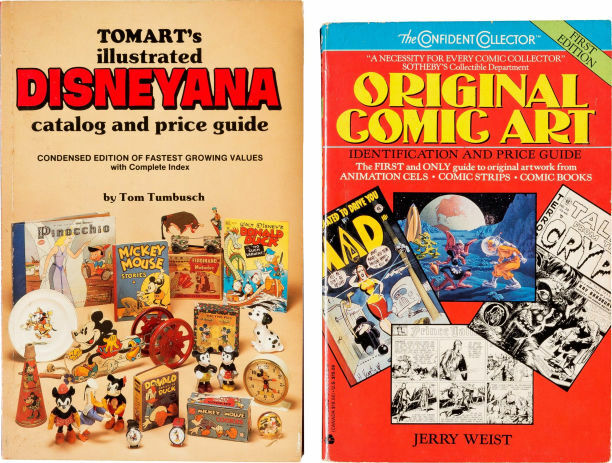 A large collection of auction and sales catalogs, mostly for original cartoon art, primarily from the 1970s-1990s. 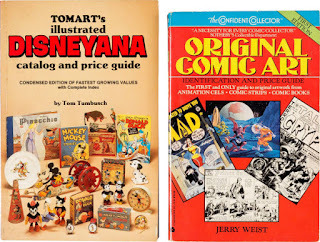 Fascinating reference material, and geez, the cheap prices in those days! A collection of six very nice R. Crumb items, featuring the scarce Vues de Sauve portfolio. Two photos above show a small sampling from a huge collection of fanzines from the 1960s to 2000s. 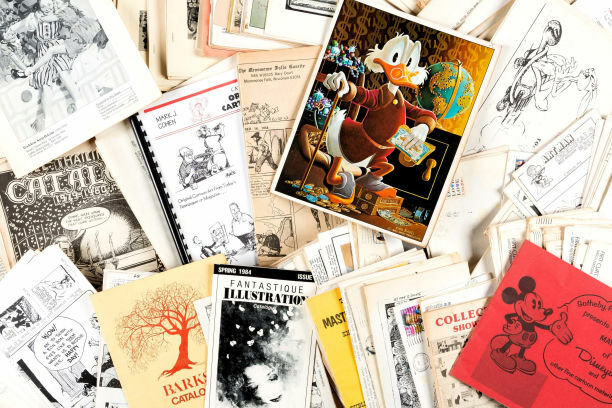 A treasure-trove of research material. 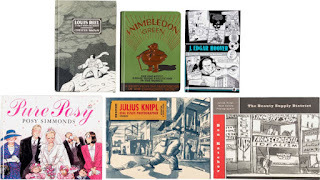 Two photos above show a collection of excellent graphic novels, a lot of great reading that will probably go cheap. 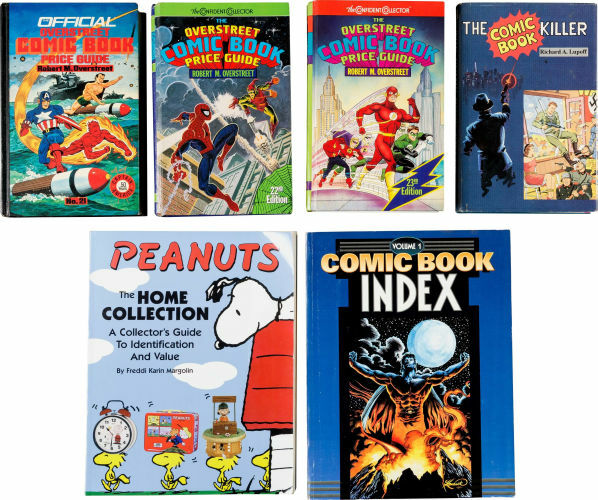 Two photos above -- a big batch of price and collecting guides, plus Richard Lupoff's novel The Comic Book Killer. Two photos above -- a collection of cartooning reference books. Giant collection of weekly syndicate proof books from King Features. Covers July-August 1996, January-February 1997 and July-December 2001; total of 40 big books. 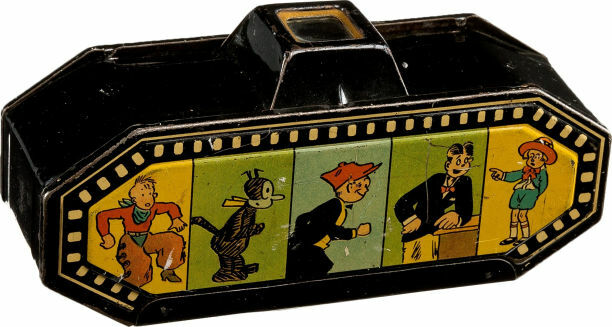 A Komic Kamera from the 1930s, complete with Gumps film strip inside. Unusual to see Krazy Kat get important billing on a toy like this. 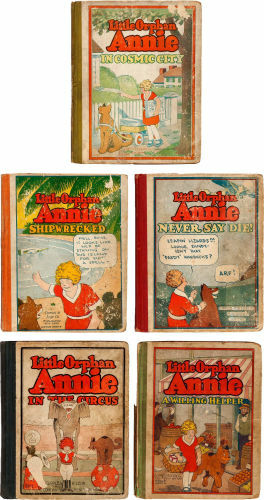 Set of United Features proof books. 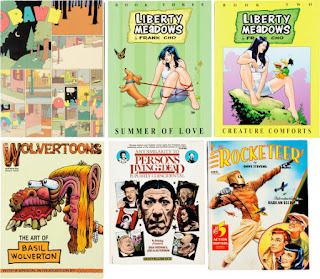 51 issues, Heritage description says just 2001-2002; I believe this lot is a complete run from October 2001 - October 2002.